The electric string quartet Asturia is a modern quartet with a unique show-program. Voices of modern electronic musical instruments, bright costumes and expression of artists turn Asturia’s performances into a spectacular show, while musical arrangements of famous music brings the new original sound. Members of the quartet Asturia are young and talented musicians with higher musical education from the Tchaikovsky National Music Academy of Ukraine. 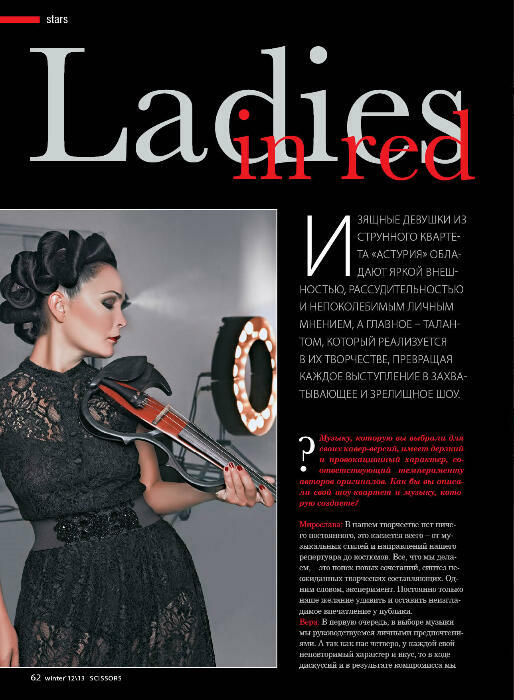 Vera Valieva (violin), Catherine Golovko (violin), Elena Moskalenko (viola) and Miroslava Tsybka (cello) are numerous winners of state competitions of violinists and cellists; they have experience in solo and chamber performances. But on one day the girls with a classical education took up electronic instruments and made the classic sound new, winning the hearts of many listeners. This is how the Asturia SHOW was born. ASTURIA is derived from the works of the famous Spanish composer Isaac Albeniz. His composition «Asturia» became the first modern treatment in the work of the group and since then is its hallmark. The composition has not only a Spanish flavor, which is visually suitable for the artists of quartet. First of all it is the passion, the temperament, expression and emotions, the powerful energy and a game of contrasts. All these qualities are the priority in the creation of new interpretations, regardless of style and trends, as well as the main emotions that girls want to pass from the stage to the audience. The quartet Asturia is not just only a modern string project. It is the union of creative people who live for one purpose – to create a new art and make the world more beautiful. In addition to the state awards, pleasant gift is a gratitude from charitable organizations. Now the quartet Asturia starts to conquer Europe and other foreign countries – France, Austria, Estonia, Russia, Kazakhstan, and the United Arab Emirates. Evening show at a large exhibition of yachts, water entertainment and spa EUREXPO LYON, Lyon, France, January 29, 2016. From September 25 to October 1, 2015 String Quartet Asturia visited with a small tour Latvia and Lithuania, where four successful solo concerts were held. 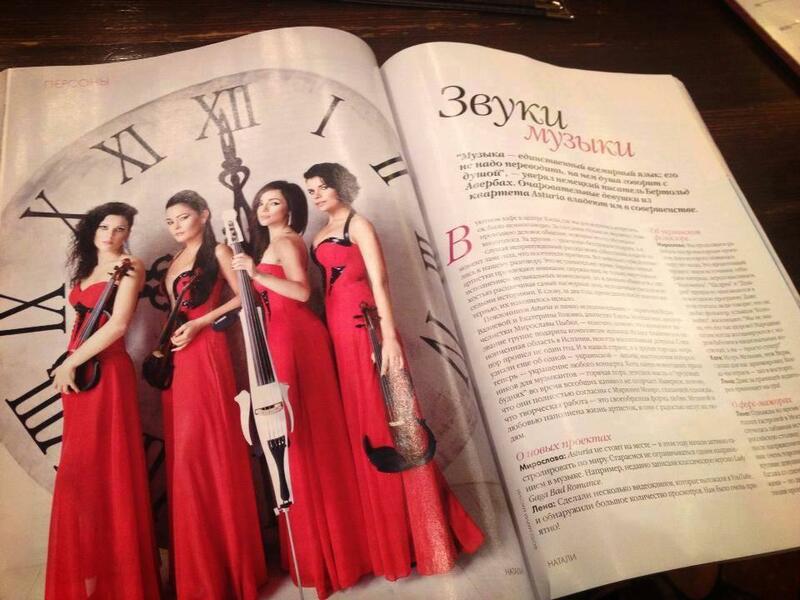 Asturias String Quartet performed at the grand opening of a luxury hotel in Dubai – Taj Palace Dubai 29 April 2015. In January 2015, Asturia made a tour with four concerts in Estonia (Jõhvi, Tartu, Tallinn and Pärnu) with a huge success. In March 2014, quartet were in one of the most famous concert halls in Europe – «Salle des Etoiles» in Monte Carlo (Monaco). In Cologne, a string quartet Asturias represented BLIZZARD Company at the largest European exhibition of computer games GAMESCOME 2013. In Morocco, Asturias participated in the fashion show “Caftan 2013” – the most significant event in the field of fashion for the Union of the Arab Maghreb, which was also attended by famous French designers and glossy magazines. In Austria, the city of Klagenfurt, a string quartet performed for the insurance company UNIQA. Hotel Jumeirah Emirates Towers in Dubai, a string quartet Asturias made performance during Power Brands Rising Stars Award 2012-13. In France, Asturia performed for LOREAL companies in Marseille in 2012 and at the beauty contest “Miss Flandre 2013” in Lille. In the city Grissan Asturia made a solo concert at the annual meeting of representatives of tourist organizations of all regions of France. 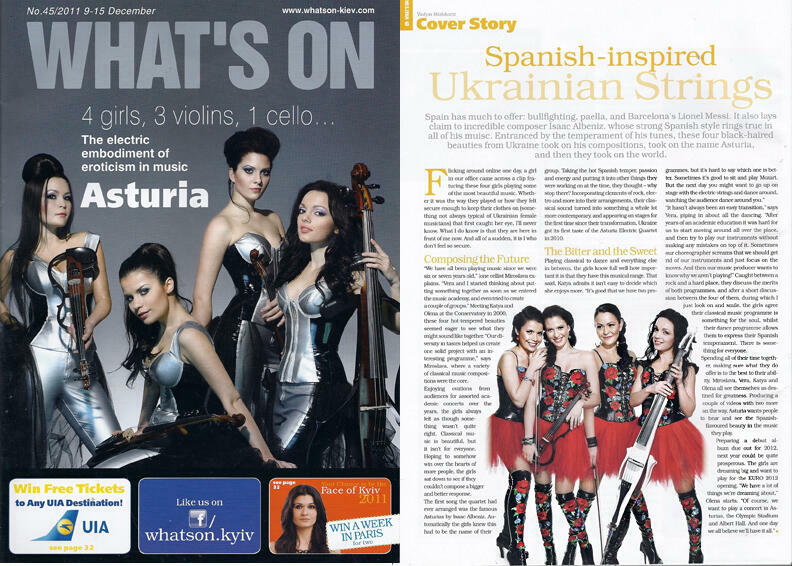 String quartet Asturia has participated in the TV show “Cars” (STB and 1+1 channels), famous program “What? Where? When?” (1 + 1) and the program “Neformat”.